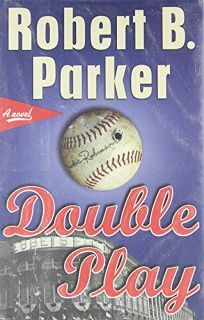 Set in 1947, Parker's superb new novel imagines what it was like for Jackie Robinson, and more centrally for Robinson's (fictional) bodyguard, to see the color barrier broken in Major League baseball. This isn't Parker's first foray outside the mystery genre, though he remains best known for his Spenser PI series (this year's Bad Business , etc. ); in 2001 he dramatized Wyatt Earp in Gunman's Rhapsody , and earlier he excelled with Perchance to Dream , Wilderness and Love and Glory . In an unusual gambit, however, this time he mixes his storytelling with his firsthand reminiscences (in chapters titled "Bobby") of growing up as a devoted Dodgers fan, a move that adds resonance and a sense of wonder to the taut narrative. The fiction, told in the third person, focuses on Joseph Burke, a WWII vet grievously wounded physically and emotionally by combat and its aftermath. Burke is a hired gun who allows himself no feelings, but when he signs on with Dodger owner Branch Rickey to protect Robinson from racist violence during the ballplayer's rookie season, he comes to respect, then love, the proud, controversial player. Burke also falls for Lauren, a self-destructive society girl with mob connections whom he worked for before Robinson, and it's from Lauren's troubles and the threat of violence surrounding Robinson that the novel's hard, smart action arises. Burke is a tough guy, and the narrative not set around baseball fields takes place in the white and black underworlds as Burke plays various gangsters against one another to protect both Lauren and Robinson.